This is one of my favorite recipes to make. They are decadent and easy to make. I got this recipe from Company's Coming- Chocolate Everything. I've made it many, many times as a treat to bring to special events. In this picture I used a small muffin liner because that is all I had and it was late, so it doesn't look like it should. These are light and creamy. 1/2 c. mini semisweet chocolate chips (yes this is listed twice). 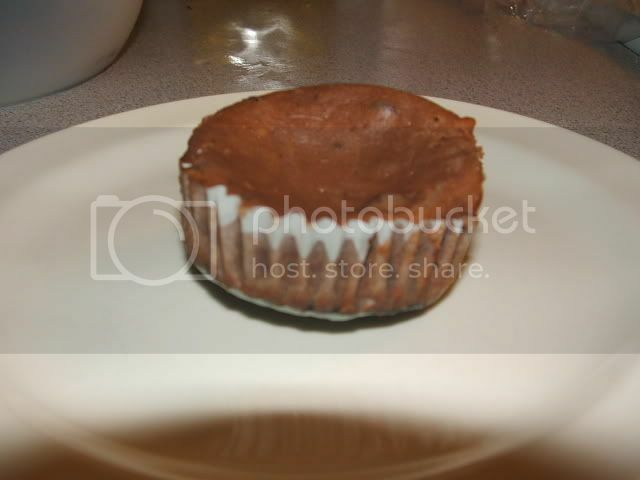 Line ungreased muffin cups with large paper liners. Place 1 wafer in bottome of each liner. Beat cream cheese and suagr in medium bowl until smooth. Beat in eggs, 1 at a time, on low just until blended. Add vanilla. Mix in. Melt first amount of chocolate chips in small saucepan over hot water, or on low, stirring constantly, until smooth. Do not overheat. Add to batter. Add second amount of chocolate chips. Fold in. Divide over wafers. Bake in 325°F oven for 25 to 30 minutes until set. Cool, then chill. Makes 12.